The Funeral Consumers Alliance (FCA) and Consumer Federation of America (CFA) released a report based on a national survey of the prices and price disclosures of a representative sample of 150 funeral homes from ten different regions of the USA. The survey revealed significant price differences – for example, from $2,580 to $13,800 for a full-service funeral – and the failure of most funeral homes to disclose their prices adequately: Only 38 of the 150 homes (25%) fully disclosed prices on their websites, while 24 (16%) failed to fully disclose prices both on their website and in response to an email and a phone call. “Most funeral homes need to give consumers much better access to price information,” said Josh Slocum, FCA’s Executive Director. “The Federal Trade Commission should update antiquated disclosure rules developed in the pre-Internet 1980s, just as California has successfully done,” he added. For example, California requires funeral homes to disclose on their websites the same prices the FTC requires funeral homes to disclose by phone or in an in-person visit. 13 of 15 surveyed California funeral homes fully disclosed prices on their websites. “The FTC needs to require funeral homes to disclose prices clearly and completely on their websites,” said FCA’s Slocum. “This disclosure will greatly increase consumer search for price information. It will also allow journalists, consumer information services, and consumer groups to much more easily research, compare, and report on prices,” Slocum added. See our previous post on shopping for funeral services. Full press release on the national funeral cost study. The Federal Trade Commission has a consumer information site with information on shopping for funeral services. The take on the process is obviously very influenced by the lobbyist for the funeral services industry but it does provide some guidelines to avoid the worst fraud and abuse by those seeking to take advantage of those grieving. Avoid emotional overspending. It’s not necessary to have the fanciest casket or the most elaborate funeral to properly honor a loved one. Recognize your rights. Laws regarding funerals and burials vary from state to state. It’s a smart move to know which goods or services the law requires you to purchase and which are optional. 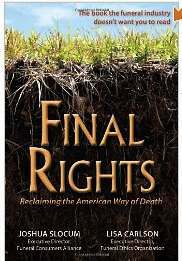 Two of leading advocates for consumer rights in dealing with the funeral industry have written a book: Final Rights: Reclaiming the American Way of Death. Joshua Slocum is executive director of Funeral Consumers Alliance, a nonprofit with over 90 chapters throughout the USA and Lisa Carlson is executive director of Funeral Ethics Organization, a nonprofit that works with the funeral industry to try to improve its ethical standards. Abuse of consumers by the funeral industry has only worsened in the decades since Jessica Mitford’s landmark expose The American Way of death. Families are exploited financially at a time of intense grief, prepaid funeral money vanishes into thin air. In eight states, families are denied the healing that can come from personal involvement in caring for their dead. But a funeral consumer movement is awakening. As with natural childbirth and hospice, Americans are asserting their right to take charge of a major event in their lives. Many still want the help of a funeral director-but to assist, not to direct. And many are handling it themselves, with home burials, green burials, or direct arrangements with a crematory. Final Rights provides the information consumers need to take back their rights under existing law, while proposing legal changes that could benefit all Americans who will plan or pay for a funeral. Death is inevitable. We may not like to think about the details but this blog is dedicated to helping people at that difficult time. It is much easier if you can take some time in advance and help those who will be asked to cope in the wake of your death to consider what should be done. This book is a helpful resource to aid that process.